The Gumball 3000 Rally is currently making its way from "Miami 2 Ibiza," stopping in several major cities along the way and wowing audiences with its cars. If you're not familiar with Gumball 3000, it's a lifestyle brand, founded by British entrepreneur Maximillion Cooper, highlighted by exotic car culture but also includes fashion and entertainment. The annual Gumball rally has grown in popularity over the last few years, and a lot of the participants, who are coming from all over the globe, are wealthy--they're driving some of the world's most expensive and rare cars--and a growing number of the drivers on the rally are celebrities. 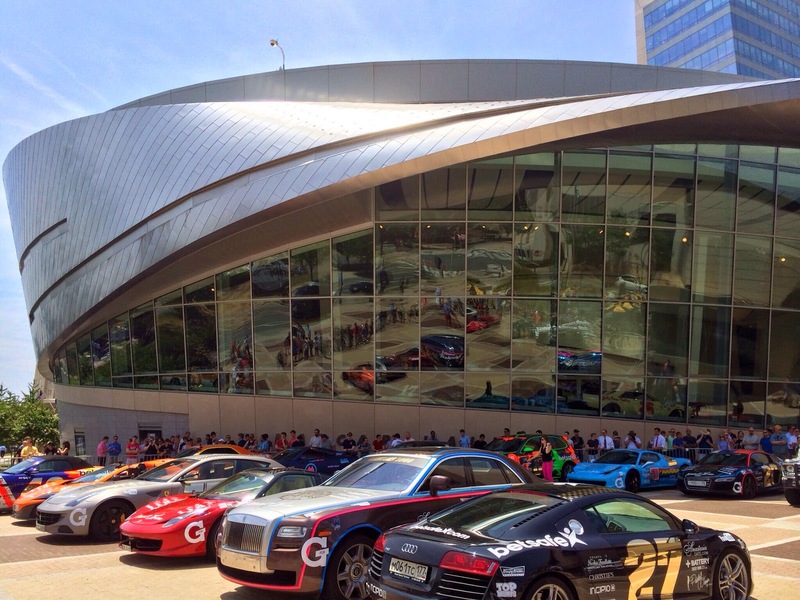 After leaving Atlanta, Gumball stopped in Charlotte last Friday, spending a few hours with several of the cars on display in front of the NASCAR Hall of Fame for the public to view (the drivers were given a private tour inside the HOF and ate lunch there). I actually received a media invite in advance to come out, meet the drivers, and even take a ride in a rare Lamborghini Gallardo LP560-4 Spyder, but I had to decline because I was going to be out of town (I attended my nephew's high school graduation, so it was worth it). I was curious about what I missed--I knew it would be a great event--so I checked social media to see what kind of photos and videos had been shared. Here's a two-and-a-half-minute video of the Atlanta and Charlotte stops, posted by Gumball's official YouTube channel. Here's a seven-minute video by GTBoard.com that shows the display of cars in front of the HOF and includes a quick interview with the Gumball creator. And there are a lot of great photos on Twitter, Instagram, and Facebook. Among the celebrities spotted in Charlotte were DJ/producer deadmau5, rapper Bun B, acclaimed photographer Estevan Oriol, and rapper/actress Eve. Eve is engaged to Maximillion (they're getting married this Saturday). After leaving Charlotte, the Gumball drivers headed to New York City. Today, they're in London and Paris. The life! Follow all the action at gumball3000.com, and the official Twitter, Facebook, and Instagram accounts (all are @gumball3000).